It’s not often that a truly unique MMORPG is released so I was excited when I first had a chance to try Wizard101 during the open beta last year. At that time, the developers were uncertain what payment model they would implement. Would Wizard101 be free to play supported by a cash shop? Would it require a subscription? As it turns out, KingsIsle Entertainment surprised everyone by implementing both methods simultaneously. I’ll discuss what I mean by this later on but for its enough to say Wizard101 is a fun game with an original setting that is initially free to play but requires either a subscription of micro payments to gain access to the bulk of the content. Wizard101 has an incredibly small file size because it relies on a download-as-you-go method where players continuously download more zones and content as they play. This means an 8mb install and a quick patch are enough to get you started. Unlike most games in the f2p market, Wizard101 has very high production value. New players are greeted by Merle Ambrose, the headmaster of Wizard Acedemy, who happens to be talking to his owl pet about how you have what it takes to save Wizard City from impending doom. Character creation soon follows in an interesting manner, players answer a series of questions which help determine their personality and play style. How you answer these questions determines which of the 7 Wizard types the game recommends for you. But don’t worry, players are given the option to simply select from a list. Each spell type is quite unique so be sure to read more about each in the overview before making a decision. The next step is a basic appearance customization process; players have several hair and face styles to chose from along with clothing colors. Oddly, players cannot chose their own names. Instead, they must mix and match words from three lists to create Wizard sounding names. For example, my character’s name is Blaine DrakeStrider. The reason for this is Wizard101’s obsession with making the game as child friendly as possible. After character creation, players are given the option to either play through the tutorial or go straight to Wizard City. I would recommend playing the tutorial at least once not only to get used to Wizard101’s unique card battles but also because it introduces the game’s villain: Malistare Drake. The tutorial walks players through a fight, or a duel as they are called in Wizard101. I generally despise video games with card based combat. A lot of games have tried this approach but few manage to pull it off. This is one such game. Sure, the combat is slow paced but the concept of wizards casting spells on each other and a turn based card game make a natural fit. Players start a duel with randomly drawn cards from their deck, which can be customized, and draw a new card each turn. Cards come in several types, damage spells, healing spells, and buff/debuff spells. I don’t want to spend too much time on the mechanics of the card game since it is all explained in the tutorial superbly, with voice acting to boot! After the tutorial, players are taken to Wizard City, or more specifically the ‘Commons’ area of the city. It is here that players receive most of their quests. Questing is vital in Wizard101 since they reward much more experience and cash then defeating monsters. There are two basic types of quests; kill quests which have you hunt down a certain number of a particular monster and what I call talk quests. These simply ask you to go from one person to another than back. Though they aren’t very exciting, they are still worth doing because of their rewards and the fact that they unlock additional quests. Wizard City itself is beautifully designed. The graphics in Wizard101 are not technically impressive but the style sure is. The cartoony graphics are done in the Western style like in Pirates of the Caribbean Online rather than the anime inspired style found in most MMORPGs like Maplestory or Florensia. As players explore the game world, they’ll find themselves spending most of their time in the first two hunting grounds; Unicorn Way and Triton Avenue. All zones with monsters in them are designed with sidewalks on the perimeter making it possible to avoid almost all encounters. This is immensely helpful since fighting even weak monster is a time consuming process because of the turn based combat. Getting through these first two zones will take several hours of gameplay during which players will receive new gear and cards. At around level 6-7, players will be denied access to a zone which a quest leads them to. When you get to this point, a menu prompt will instruct you to visit the official website and purchase either a subscription or an access pass. I had mentioned earlier that during beta the publishers had not yet determined a payment model for the game. After its official release, only the first few zones became available to free players. In order to access most of the game world, players either need to subscribe for $10/month or purchase each new zone piece by piece. This concept of purchasing access to zones one by one is something I haven’t seen until now. The premium currency is titled ‘crowns’ and can be purchased in batches of $5 dollars or more. Three additional zones can be purchased for $5 to complete the Wizard City area but there are currently 4 other areas; Krokotopia (Egyptian themed), Marleybone (Victorian England themed), Moo Shu (ancient Japan themed), and Dragonspyre (ancient Rome themed.) The current level cap is 50 but this will rise when more areas are implemented. So free accounts have access to less than 20% of the game’s content. The fact that so much of the game is off limits without payment cripples Wizard101 but the free content should be more than enough for players to make up their minds whether or not this game is for them. It is clear from the beginning that Wizard101 caters to a young audience with the Harry Potter theme but it has managed to attract many older gamers as well. The game’s publishers have recently celebrated the millionth account sign up so the game is already a success. Personally, I’m hoping for more of the game to be made free as time goes by. Perhaps in-game methods of earning crowns would extend the free to play aspects and make them viable. As it stands, Wizard101 is more of a free trial than a full fledged free to play game. 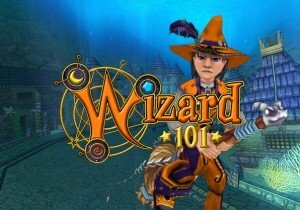 Even though only a small portion of the game is free to play, I give Wizard101 a ‘good’ because it is so original and well crafted that any gamer looking for something new should give it a try. The cartoony graphics and card dueling system make Wizard101 very much a hit or miss game. Luvinia's level cap is bumped up as the game prepares for the WINGS expansion in March 2013.